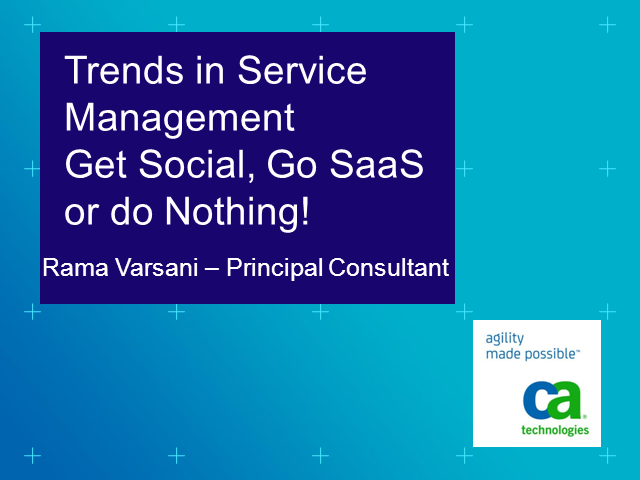 Trends in Service Management: Get Social, Go SaaS or Do Nothing! 3) the expanding new generation of "social-media-oriented employees"
This session will cover the Characteristics and benefits of a hosted, an On-premise, or a SaaS Service Management solution. Detailed information is also provided on the key factors to consider when transitioning from an On-premise to a SaaS solution. Title: Trends in Service Management: Get Social, Go SaaS or Do Nothing!